Pictured Above: The Peregrine Falcon. Residents of Dublin 4 might not be aware that right in the heart of Dublin, on the Poolbeg Chimneys, a pair of resident Peregrine Falcons peer out over their territory of Dublin bay and Poolbeg peninsula. These superstars of nature nesting on our iconic structures have been brought into the spotlight recently by a short documentary by Alan Caulfield. It was then that White told him about his friend Eamonn Ryan, who visits the Poolbeg Chimneys regularly to look at the Peregrine Falcons who nest there. The light went on in Caulfield’s head as he realised he had to bring awareness about these birds to the public. He jokes how he could have played up the ‘arty’ framing of the story of how the rare and once-threatened species might reflect metaphorically on the endangered towers, and vica versa, but the documentary pulls back from that. The documentary, Quill to Power, is available on YouTube and features Ryan and White, who both know quite a lot about this bird that we are lucky to have in our midst. It features images of them on the Poolbeg Chimneys as well as a beautiful Peregrine Falcon specimen that White brings along and perches on his arm as he talks. Sandymount resident Ryan has been a bird enthusiast since a little boy, and became aware of the peregrine falcons many years ago. Often you might see him out near Shelley Banks with a telescope, observing the fascinating flights of the falcons. The re-strengthening of falcons’ numbers across the world has come about due to their adapting to high cityscapes. “They can use the high bridge ledges or anything on high buildings with a little bit of a flat surface with scree or gravel. They don’t have a bird’s nest in the traditional sense,” said Ryan. 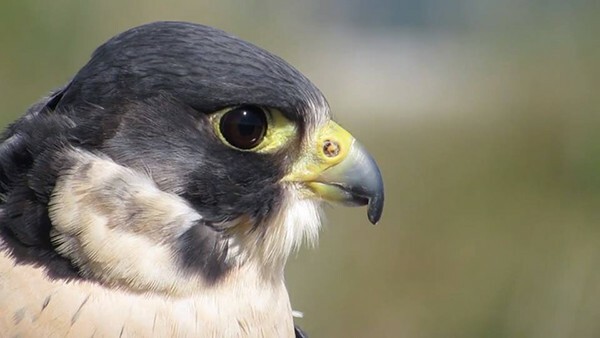 Peregrine Falcons were endangered in the 1960s due to organo-chloride pesticides such as DDT. However, their numbers have come back up quite well and White informs NewsFour that Ireland has one of the best number densities in Europe for Peregrine Falcons, as they love high cityscapes as well as rugged cliff tops in the wild. As for the Poolbeg Falcons, “They’re actually living in a purpose-built nest box put up there by ESB engineers,” said Caulfield. He also has the idea that a nestbox live web-feed copying other city nests around the world would be a great thing for the ESB to do. Recently, the falcons here have bred and chicks have hatched and grown. “They would be fully formed by six weeks and they hang around for another two to three weeks before going off to find their own territory,” said White. So when out walking on Sandymount or near Poolbeg lighthouse have a look to the skies as well as the sea. You might see the speed, the dance, and the hunt of the Poolbeg Peregrine.